A wonderful counterpoint to regular game drives – it's hard to beat drifting peacefully in a 'mokoro' along the reed-fringed channels of the beautiful Okavango Delta. Botswana's Okavango Delta is one of the best places to head for if it's time on the water that you are after, whether it's in an outboard-powered boat, paddling a canoe, or being poled by your guide in a mokoro – the local dug-out canoe, although nowadays made of fibreglass to preserve the trees! For the more adventurous it is possible to organise three- or four-night expeditions where you will paddle your own canoe, encountering wildlife along the way, sleep in simple tents in an impromptu fly camp on the banks of the river, and even experience the thrill of walking in the bush. Canoe safaris can be done on the Selinda Spillway adjacent to the Okavango Delta, and along the Zambezi in Mana Pools National Park in Zimbabwe or Lower Zambezi National Park in Zambia. 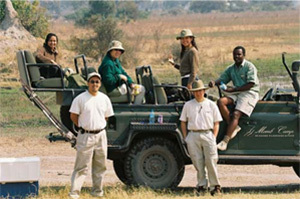 Another excellent destination to enjoy the water is South Luangwa National Park in Zambia. 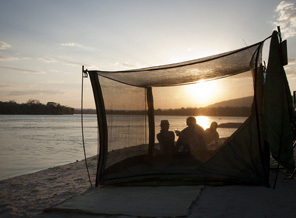 Each year during the summer months the Luangwa River floods and by mid-January becomes navigable, which is when the valley is perhaps at its most dramatic and beautiful. 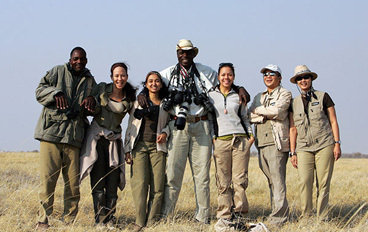 The bush is lush and verdant, rivers and lagoons are brimming and boating safaris take you eye to eye with hippos and crocodiles. Magnificent skyscapes and sunsets, a wealth of migratory birds, crystal clear night skies and occasional dramatic tropical downpours provide the back drop for a safari during the most exciting time to be in the South Luangwa Valley. Water activities can also be enjoyed at many other destinations – including along the remote Kunene River in northern Namibia, the mighty Zambezi river from Victoria Falls and further downstream at Mana Pools and Lower Zambezi National Parks, the Rufiji and Sand rivers in the Selous Game Reserve in Tanzania, and along Africa's iconic Rift Valley lakes in Kenya, Tanzania and Malawi.